There are a lot of fine dining establishments in Thailand where you can get everything from authentic Thai and Chinese cuisine to Proper English and Russian dishes. For me though I love the food carts. They line the streets wherever you go and serve everything from fresh fruit to BBQ meat and seafood. If you’re lucky you’ll even run into the doughnut and dessert carts. You know your in Thailand when you can smell yourself to your destination…even if you’ve just eaten you’ll be hungry for more. 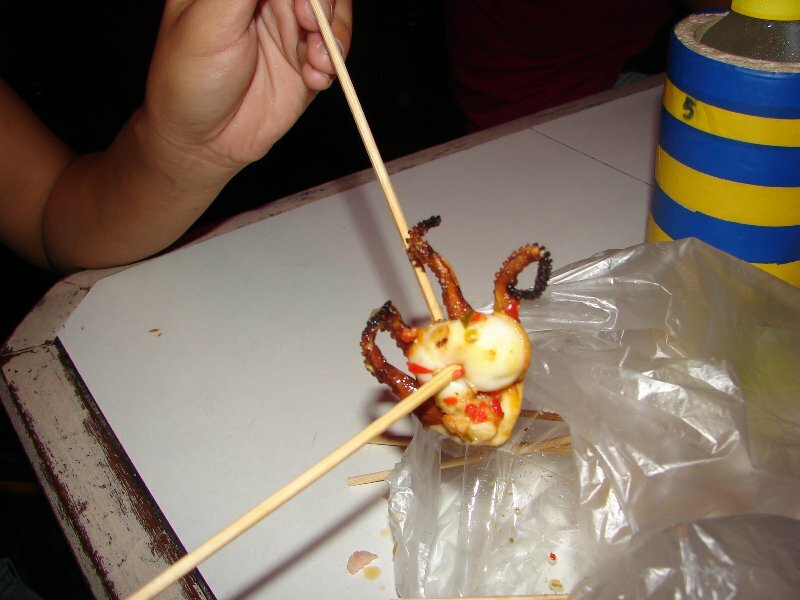 The chicken skewers with pineapple and peppers lightly basted with garlic butter or the BBQ octopus so succulent dipped into some spicy Thai hot sauce…it really is heaven. The best thing is you always run into something you haven’t seen or eaten before so it becomes a tasty game. The first time I saw chicken hearts I wasn’t too sure it was something I wanted to try but now it’s the first thing I look for. 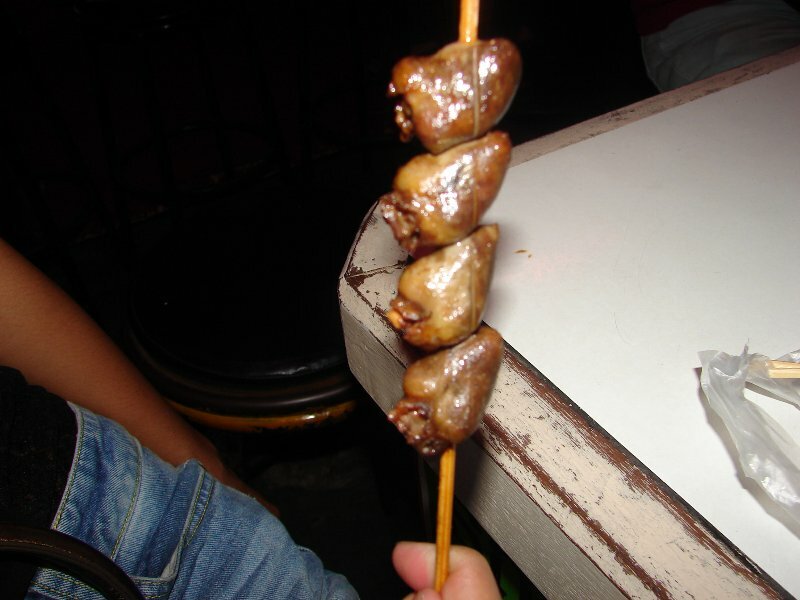 Chicken hearts when cooked right are very tender and have an excellent taste. 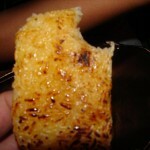 And let’s not forget a side order of BBQ sticky rice made into a patty and basted with garlic butter. Then you have the assortment of fish balls, stuffed crab shells, and whole assortment of other animal parts…they let nothing go to waste. You’d be amazed that testicles can taste very good but for my money I’d stay away from anything made with lung. Then of course there all the different bug carts for your snacking pleasure. You can have a 5 course meal prepared for you in minutes just walking down one side street and it’s guaranteed to be some of the best food you’ve ever eaten in your life. Best part is it will cost you very little to have your fill and still have food left over. 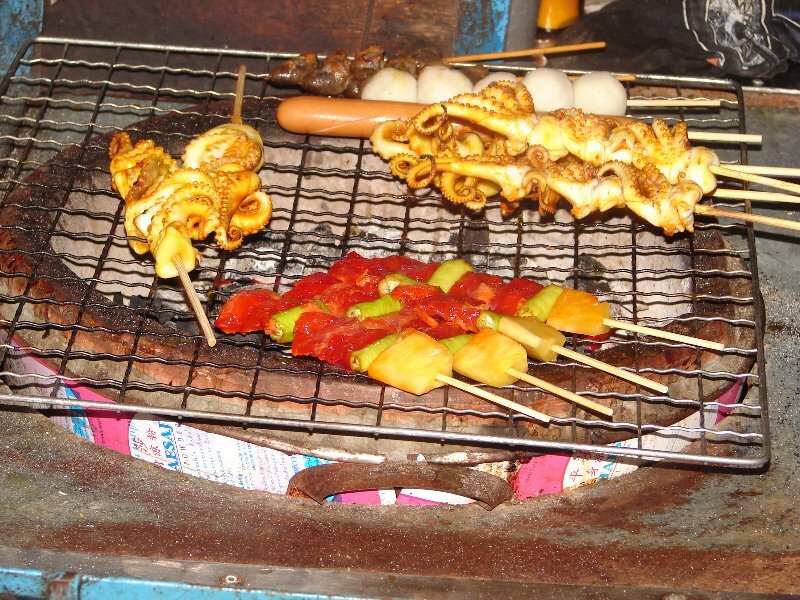 In my experience the the majority of the food I’ve seen has always been fresh and kept on ice and the skewers and fish balls you see sitting out are BBQ’d or Fried very well so there is little concern for food poisoning.I’m not saying it can’t happen but if you make sure they cook it long enough you’ll be fine. The real treat is experiencing all the smells and sights at the same time it really is a foodies heaven walking through the street markets and checking out all the goods. Sure it’s nice to hit real restaurants and treat yourself to a good meal with nice atmosphere now and again but I guarantee you’ll get a great meal off the carts and trust me nothing beats the atmosphere hanging out on a street corner in Bangkok, Pattaya, or Mukdahan with good friends and good food. If you’re still looking for that fine thai dining experience, when in Bangkok make sure you make a reservation at the Shell gas station. I love the scenic view of Thai food, i also love their spicy food! i love Thai Foods. if we get a chance to go to thailand, cart food is definitely one of the things that im gonna try. 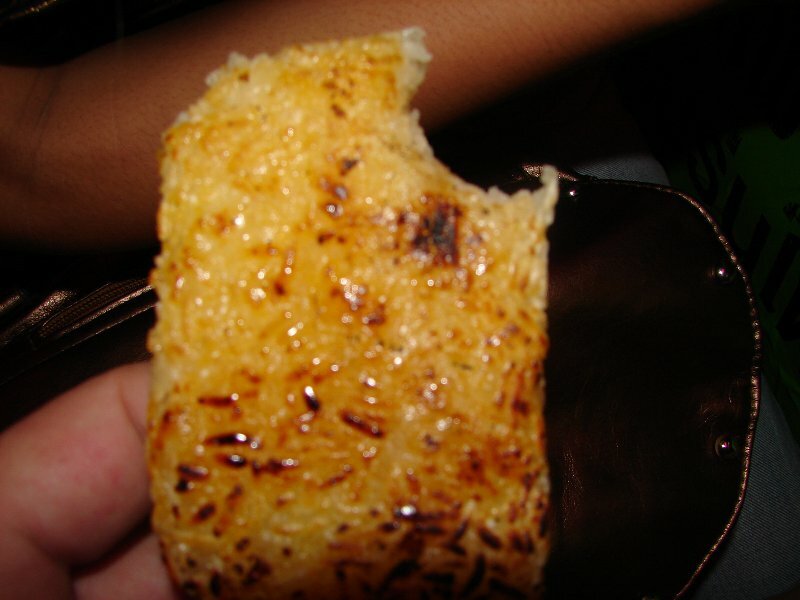 hehe we have something similar in the Philippines and i miss the street foods there. All of SEA has great food and food carts…The only food carts you’ll find in America, if you can find them, are hot dogs and pretzels. 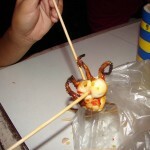 I love street food! 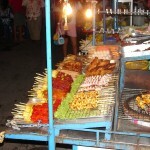 I think some of the best food I’ve tasted, especially any food on a stick and grilled :), was bought off a cart. I’d definitely go to Thailand just for the food. ahhhh my favorites were the chicken liver and sticky rice and satay!!!! I’m with you they are great and that just leaves more for us…besides they eat chicken I bet. Oh.. You make me homesick.. Can’t wait to go back and eat my heart out. I can’t wait to get back myself. I was reading your blog and hadn’t realized you’ve been away form Thailand for 10 years…I honestly didn’t think that was possible…how did you do it without having all that great home cooked food? I know quite a few Thais that have told me they couldn’t come to America because they would die without real Thai food. I would kill for a good Pad Thai right about now. That BBQ sticky rice looks divine too. chicken hearts! wow… that’s my fave part of the chicken, aside from the wings. yummy! I miss Amazing Thailand too… we just cooked tom-yum last night, but I miss the authentic one. I love Thai food, between Thai and Indian! 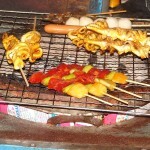 I love Bangkok’s street BBQ the best! I love to eat, and will eat most anything. But, i’m not sure about other country food. I have watch to many programs on T.V. we also have something similar here in the philippines. we call it street food and it ranges from chicken liver, chicken gizzard, cubed chicken blood, chicken feet or adidas as we call it based from the Adidas running shoes. we also have pork and chicken intestines or isaw, we have premature duck eggs or balot/balut. we have kwek kwek which are orange colored breaded quail eggs. 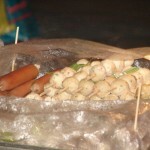 we also have kikiam, fish balls, squid balls, hotdogs and pork barbeque. the thing is, you really can’t be sure they’re totally clean so you better see to it that they’re well-cooked. eating so is at your own risk, hehehe. ooo I can’t wait to get back to thailand next month. I miss thai food soooo much. 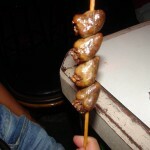 wow, i didnt know they have chicken hearts there. wow. i actually tried the bbq pork once. that was awesome! Hey Talen, thanks for your comment on my blog. You had a good point there when you mentioned that social networking traffic is crap :). Indeed it is, at least advertising wise (CTR is just horrible on the days I recieve massive traffic from stumble). I acctually discussed this in my post Is AdSense right for you? Depends on your traffic! ps. your post made me hungry! I love thai food, its a shame that its a long way to thailand, and its hard to find decent places in europe. WoW,This so makes me miss Thailand.I spent time there of and on for about three years as a child with my parents.Being that I was never a picky eater I can recall the sights smell and tastes of everything you mentioned in this post.Thanks for the reminder and the motivation. I’m alright with this kind of food…we also have this in the Philippines. 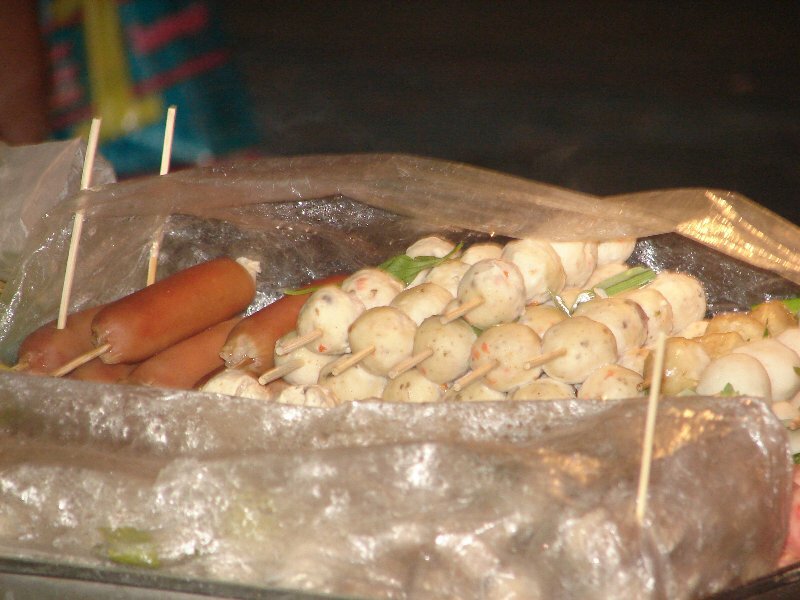 We call it street food because they sell them on streets, in a moving carts or in stalls. yeah, they are really yummy…just be very carefull in choosing where to buy ‘em so you won’t put your health in risk. 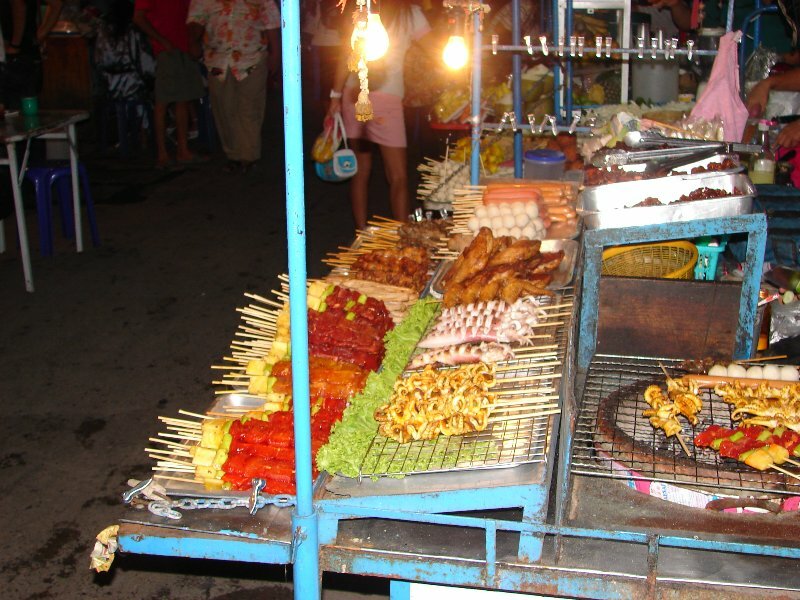 I love street food in Thailand. It’s very yummy. Reading your post makes me a little homesick. Too bad there is no such delicious food in America. Can’t wait to go back to Thailand. It really is a shame there isn’t anything like it in America. Back in the early 1900’s there were all kinds of street vendors selling food from around the world…now the best you can find is a hot dog or pretzel. © Copyright Thailand Land of Smiles 2007-2008. All rights reserved.